Tournament Chess II Game Review - Download and Play Free Version! Enjoy the excitement of playing chess by advancing from clubs to a master tournament! Large range of computer opponent personalities and difficulties. Watching famous matches is useful to learn new strategies. Interactive coach helps you make the best moves in practice mode. Unlock different Chess board styles by winning matches. Play your way to the master tournament! In Tournament Chess II, you will have the opportunity to play against 80 different opponents and even have a "coach" watch your play and tell you what mistakes you are making! Go from a casual chess player to an expert! 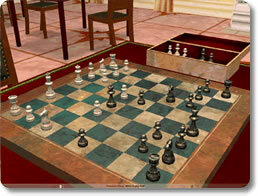 Playing Tournament Chess II will be addicting and enjoyable as you interasct with the rich 3D graphics. The boards, the pieces and the opponents are all richly rendered to give you a feel like you are playing actual opponents in your home! Of course you can choose to play real opponents too! Go online and play real people to see if your practice is paying off in real games. Tournament chess is for both the beginner wanting to learn to play with more skill or the advanced player wanting to fine tune their skill! Tournament Chess II provides an excellent and in-depth chess experience. You can learn how to play chess or even hone your skills if you are a master player. Everyone from absolute beginner to seasoned pro will be able to find a challenge in this game. The 3D chess board and simulated room will make you feel like you really have a chess board in front of you. This game is played with the normal rules of chess. A “coach” can be turned on in practice play. The coach will offer hints about which move you should make. You can also turn on options that tell you where any particular piece can move and what pieces are in danger of being captured. You can also adjust the appearance of the chess board and pieces. There are traditional style, rock, metal and more as you unlock all the different sets. There are a variety of levels of computer opponents to play against in the practice mode and 80 computer personalities that have specific play styles and difficulties. They range from beginner to pro chess player. Each computer personality will have a skill rating, play experience and a certain play style. Things like defense and carelessness will let you know how well you can do against the computer. The lowest difficulty computer will make moves that are completely random and accomplish nothing while also throwing in strategic moves. Another great learning tool for this game is the classic chess matches. Many matches that have been played by professionals are saved to this game and you can progress through them move by move to learn from them. While playing all the information that you could need is shown in various boxes. The moves list is shown as well as the captured pieces. There is even an announcer that will call out all the moves and captures. If you get tired of playing against the computer, there is the option of online multiplayer. The online multiplayer uses a ranking system so you will not be placed against players who are much more skilled than you. As you win games you will rank up. On top of standard chess rules there are also fur alternate chess-like games: Rifle, Swap, Back Rank and Losing Chess. These will offer challenging new rules for everyone. Rifle Chess allows you to capture pieces then immediately return to where you started preventing you from having to sacrifice pieces. Losing Chess requires you to lose all your pieces to win. Capturing is mandatory so you must place all your pieces in danger. The graphics in this chess game are excellent. 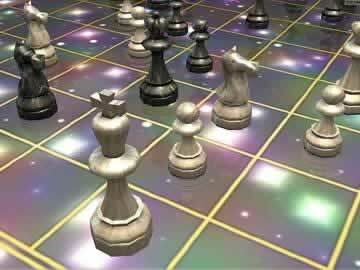 The 3D game board looks real and lets you feel like you really have a chess board in front of you. The simulated room you are in has great detail and you can look around both the room and the chess board while you are playing. The sound also contributes to this. Each time you move a piece it sounds like you just set it down on the board. The announcer is a good touch too. While the sound and graphics aren't top of the line they are definitely above average for the chess genre. The game really only has one minor flaw. The option menus are quite extensive and don't offer much help. If you are familiar with the rules and lingo of chess than this will not present a problem. If you are not familiar with the intricacies of chess than you might have to do some research to figure out what certain settings will adjust in the game. 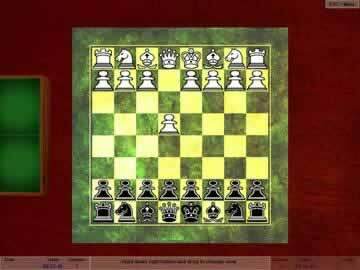 Tournament Chess II brings all the strategic elements of chess to your computer. With the large variety of computer opponents, players of any skill level will be able to learn and play. Practice, classic matches, an interactive coach, and online games are just a few of the tools that will help you become the best chess player you can be. All ages will enjoy this great game.